This is a cell phone capture of a picture that Bay Photo developed 28 years ago and the original on my wall actually looks much better. It is a 20 x 30 that was never protected by U.V. glass , yet has held up remarkably well. This is why I selected them as my Smugmug designated printer . Their quality and customer service is simply wonderful. In fact metal prints and their other prints should hold up even better. Metal prints almost reaching archival quality. This picture was made to look like an action shot but it was actually something I staged because I was shooting Ektar 25 with my Olympus OM1n on a tripod. It was a very slow film and fast shutter speeds to freeze action I couldn't use because it wouldn't give the film enough light. To slow the action down I positioned them far enough apart and had them stretch to reach each other in a hand off type situation. They actually slowed down themselves as they got closer. The background is the Monterey Bay in Monterey. Of course as a father I love it and the sibling cooperation . 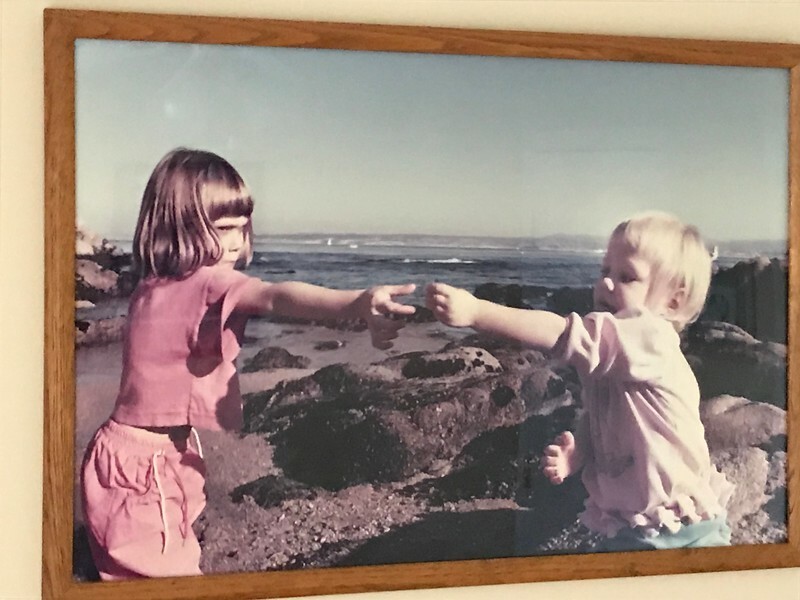 As my photography skills progressed I learned more and in later years would never have had a sea gull behind my daughter Emily's head on the right. Even at that I still love this photo.